you do this in 15 mins.. you efficient.. hehe..
wow, that's cool to have a mom-daughter and dad-son day out! Just started reading your blog today, I am a mom-to-be but I nanny four young children and every time I make their lunches I am so sad to see that they are just getting pb&j and an apple, that just doesn't seem enough to me. Not for a 2nd and 3rd grader. I have always loved bento and wanted to get into it, sadly the guys at my hubby's work made fun of him for the lunches (even though he loved them) and its kinda hard to find supplies around here. But I read through your blog today and I would like to say you are amazing! These are all super cute! @Jenny : Hi Jen! Thanks a lot for stopping by and read my blog! Don't worry about other people thoughts as long as you prepare a healthy balance bento. Especially if your hubby likes it. For the bento tools, you can get them from online stores like Bento & Co, J-List, J-Mama & Baby or some sellers on eBay. I got most of my bento tools online too. Have fun in bento making and have a great weekend! @tatabonita : Thanks a lot Ta! My kids don't want me to put too much details on their food. So the only thing that I can do is to make a character on the top of the rice. Probably they will say no need for cute thing anymore very soon hehehe :D I bought that bento box from Bento & Co a while ago, pink for Big A and white one for Little A. The size just perfect for their lunch portion. Love it! wow, you have quick hands and mind! Wow! Fast bento! And cute, too! Ha! You just had an hour and a half and you were worried? That's crazy that you cook food morning for lunch. I feel bad just giving my daughter a sandwich everyday. lol. How long does it usually take you to prepare a bento? How long does it usually take you to make bento? @shane : Most of Indonesian, won't feel full until we get rice for our meal hehehe ... My bento preparation time is vary depends on the character and cooking I need to do. Usually about 30mins. to 2 hours (including cooking time). Thanks a lot Shane! @Lina Gladman : Thanks a lot Lin! I try my best to keep organize in the kitchen. Sometimes it fails badly hehehe :D Happy weekend! Things you can do with food picks...:)! And the chili prawns look super delicious!! @Cooking Gallery : Thanks a lot Sin! @Mischievous Mack : Thanks a lot for your kind comment! 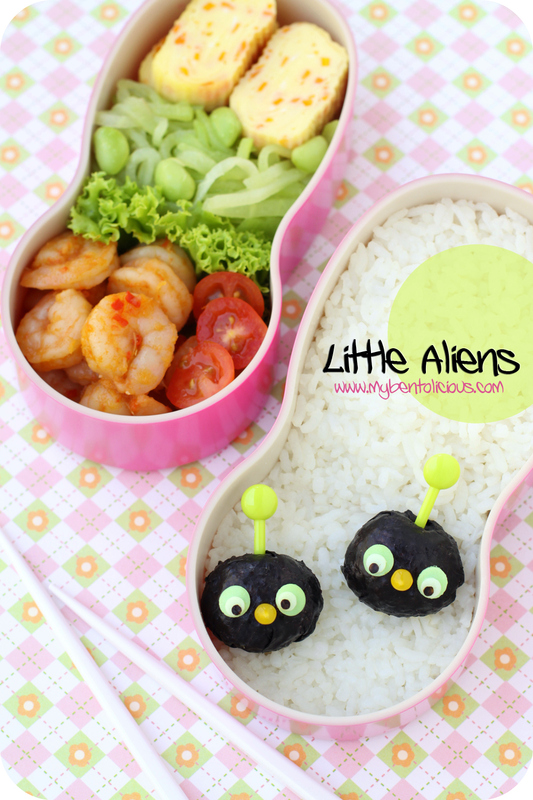 Cutie Alien..want to hugs them..hihihi..
i never make bento before.. So many CUTE Halloween bentos. I love the bat one! Don't forget to enter these in the Halloween meme at Bento Blog Network. Those little aliens are out-of-this-world CUTE! They look like penguin babies to me, teehee. Love! Would love to try these for my boy's bento. Thanks for the inspiration!